I made the trek to Mid-Ohio to be the race engineer for Euro Motor Racing for the June 19th Conti Challenge Race. For the first time in team history, we had a pro driver in the seat with team owner Terry Heat so we had high hopes for the weekend. After working with Bryan throughout the weekend, I can say I was thoroughly impressed with his driver coaching, quickness, teamwork, and attitude. 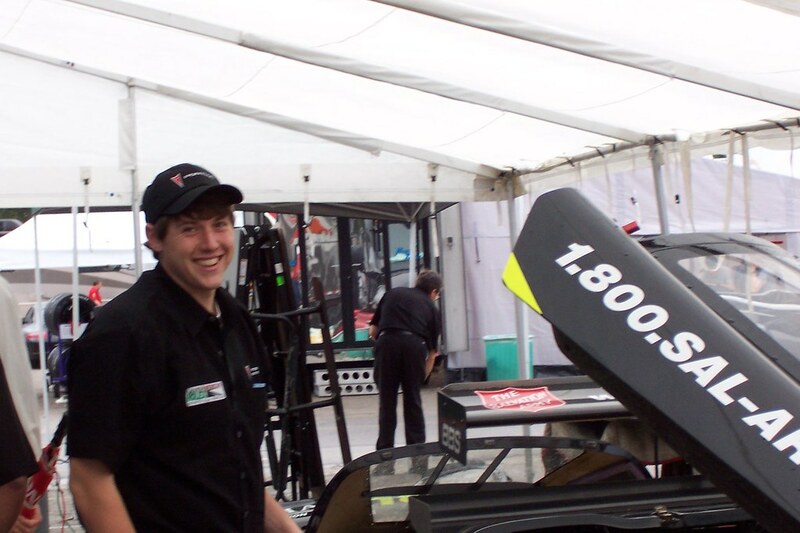 Terry was a competitive CTSCC driver before, but Bryan still managed to improve his fast lap at Mid-Ohio by 1.5s. Our fast lap from 2009 was a 1:36.2 and Terry qualified this year with a 1:34.005 to qualify in our best starting position yet, P9 out of the 32 car GS field. In Grand-Am, the driver who qualifies must start the race. Our basic strategy was to run a 2-stop race getting Bryan in the car within the first 40 minutes of the 2.5 hour race and then making a splash n' go pit stop later in the race. Terry had a great opening stint picking up 1 spot at the start and moving up to P6 by lap 20 when we caught a yellow and made our 1st pit stop. Bryan hopped in the car after we dropped back to P19 due to the pit stop and immediately started charging through the field. We were back up to P10 by lap 35 and were the quickest car on track, but things started to go wrong on lap 38 when the yellow flag flew. Our pit window opened up on Lap 47 so we decided not to make our 2nd pit stop because we didn't want to gamble on yellows later in the race. This proved to be a mistake because all of the leaders made pit stops and ended up getting the yellows to make it to the end on fuel. However, this moved us to P1 where we stayed for the next 10 laps. Bryan continued to be fast and we had a 7 second lead on the field before we made our 2nd pit stop under yellow on lap 49. After the stop, we rejoined the field in P17. After we worked our way back up to P11 in a few laps, 4th gear in the transmission broke and this killed our progress. We struggled for the rest of the race with 3rd to 5th shifts and brought it home in 12th place. While 12th place is still in the money and not bad considering we lost 4th gear in the middle of the race, the finish was very disappointing. We had the car, driver, and team to finish on the podium had we made the right strategy call on lap 40 and had the transmission stayed together. Hey at least we did bring home fast race lap and new track record with a 1:33.274! 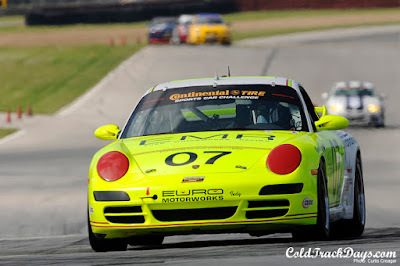 I leave for Mid-Ohio tomorrow to crew for the #07 Euro Motorworks Racing Porsche for this Saturday's Grand-Am CTSCC race. I planned the race strategy for the team and will be the race engineer and rear tire changer for the race this weekend. I've been working on strategy with the team during the season, but this will be my first and only Grand-Am race of this season. It will be good to be back at a big race track. Team-owner Terry Heath and Bryan Sellers will be driving for EMR this weekend. Bryan is the first pro we've had race with us so he should be the quickest driver we've had in the #07. With Terry's experience at Mid-Ohio and Bryan's pace, we have high-hopes for this weekend. Currently 63 cars are registered for the combined GS/ST race, so it should be an exciting race with that many cars on a narrow, difficult-to-pass track like Mid-Ohio. Ken Block is at it again. He and his team are planning a third Gymkhana film that will surely fuel his internet stardom, but this time he is looking for his fan's ideas for the location and signature trick he will perform. The article and video below have contest details. Submission deadline is tonight at Midnight Pacific-time so think fast if you haven't sent something in. I submitted mine earlier......wish me luck. Considering what my Dad and I autocross, I found this very interesting. I hope Porsche accepts. 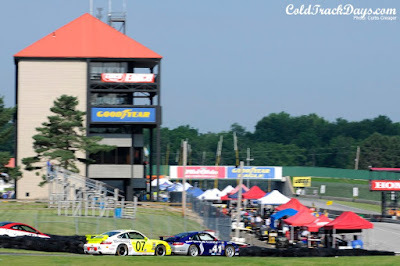 Congrats to HART for the 4th place finish in ST class and to Euro Motorworks Racing for the solid finish on the lead lap in Saturday's Continental Tire 150 at Watkins Glen. I helped Euro Motorworks Racing team owner Terry Heath calculate race and fuel strategy for Watkins Glen which helped the team stay on the lead lap and come home in a respectable 14th position out of 36 GS class entries and 76 total entries. The weekend started off hectic for EM Racing as a cooling system problem caused them to miss most of the first practice. After replacing the water pump and thermostat, they were problem-free for the rest of the weekend. Kasey Kuhlman qualified the car in 21st position in his first outing with the team and he and Terry moved the car up seven positions during the 2.5 hour race. The team improved upon their 2009 Watkins Glen performance by being faster throughout the weekend and closer to the fastest race lap set by the # 41 TRG Porsche. Terry and Euro Motorworks Racing will be back in action in two weeks at Mid-Ohio. 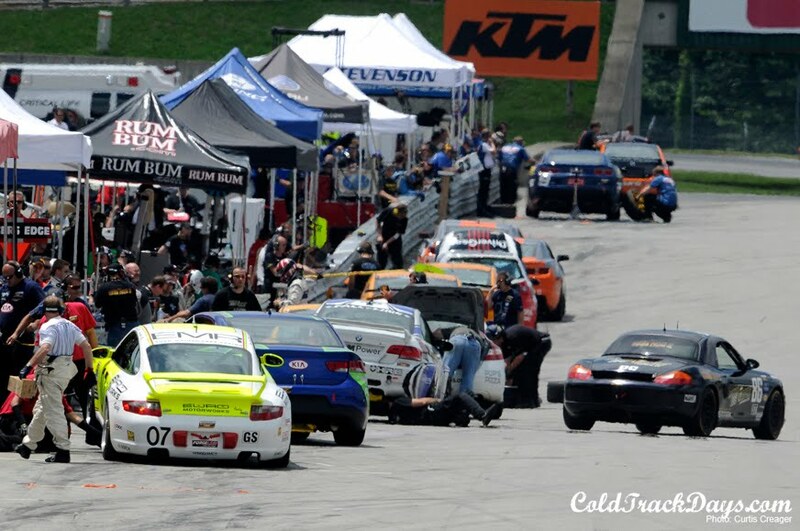 You can catch the Watkins Glen Conti Challenge race on Speed TV this Saturday 6/13 at 1PM ET. Unfortunately and despite ordering parts several weeks ago, only the 1st 4 items were delivered in time for this event. This meant no stiffer rear ARB and coilovers for this 1st event competing against fully-prepped RWD RX-8s and Subarus in a FWD car. Not a good combination considering we desperately need these parts to tune our FWD Mini to rotate properly in the corners. With just a modified alignment and wider tires, we made the trek to DC to compete in STX class. Overall, it was a still a great learning experience for both of us. We each got tons of seat time (for an autocross...) in the car and both improved our driving throughout the weekend. The seat time was a big help for me considering this weekend was the 1st time I've seen my Dad's car. After the 2-days of racing, I finished in 8th place and my Dad finished 13th out of 14 drivers (Full Results here). I was beaten by 2 drivers in a fully-prepped RX-8 and 5 fully-prepped Subaru WRX drivers. I don't feel too bad about that, but it is not the result I was looking for. I hate blaming it on the car, but our Mini was not competitive with it's limited prep this weekend. On the bright-side, the rest of out parts should be coming in next week and we will have the car ready to rock for out next event in July. The winner, Chike Dellimore, in an RX-8, will be at our next event so it should be a good judge on how far the Mini has come along. Now, enjoy video and pictures from the autocross below. 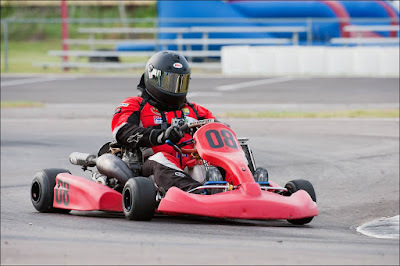 I ran my first race in the shifter kart on May 22nd and 23rd. 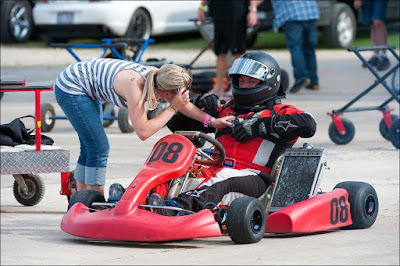 As I posted earlier, the race was a charity event for Kali's Cure (a group raising money for spinal cord injury research) and took place at North Texas Kartway. My weekend certainly had its ups and downs, but I managed to improve my times around NTK and learn more about shifter kart racing. I went into the weekend looking at it as mainly practice with not much of a chance of being competitive considering everybody I was racing against had been racing shifters at NTK for atleast a year. 1) I missed qualifying, the Pre-Final, and the Final on Saturday with brake issues. After the 2nd practice session on Saturday, both master cylinders seized. After finally finding the issue, I rebuilt both MCs, but only had one rebuild kit which meant I had to turn down one of the MC plungers with emory cloth to make it fit back in the master cylinder. 2) I missed the pre-final on Sunday because my engine flooded on the kart stand and I could not get it re-fired. After fixing the issue, I was ready and looking forward to Sunday's 16-lap final until my shift lever came unbolted on Lap 1. I was able to continue running until Lap 3 when I was no longer able to downshift because the shifter lever was so far off-axis. 1) From my 1st laps around NTK on May 8th, I improved my time by 3 seconds - 42.5s to 39.5s. I still have work to do to be competitive, but this was a huge improvement for me. 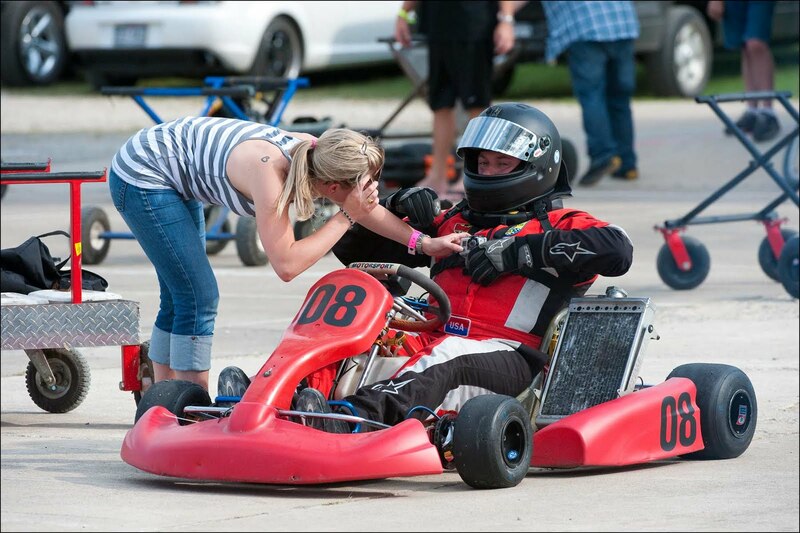 2) I fixed a lot of nagging problems with my new kart, was able to learn more about its strengths and weaknesses, and made good contacts with kart shops in Texas. Well, that about sums it up. It was very frustrating to miss tracktime, but I like to look at the bright-side which is me getting faster and learning. I'm tired of these small issues keeping me off-track to the kart is getting a complete inspection and overhaul before the next race.